This is the largest member of the Sciuridae (Squirrel) Family and it occurs all across Tennessee. 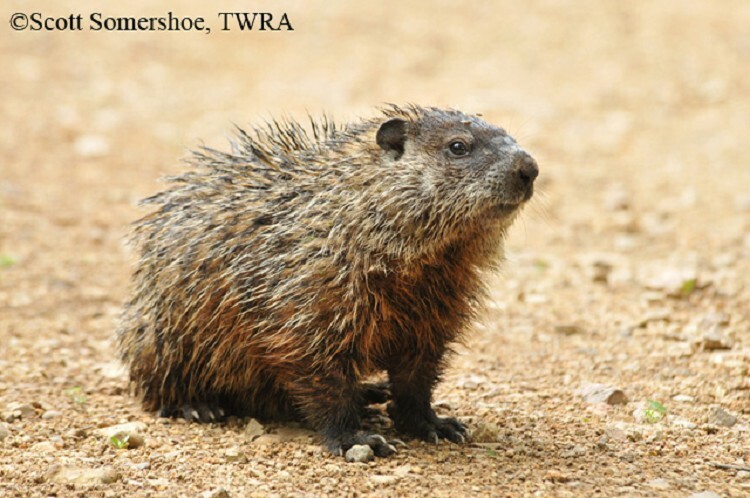 Woodchucks, also known as "groundhogs", are well-known for their habitat of excavating burrows and sitting upright next to them. Description: This medium-sized mammal has a stout body. It is covered in brown wooly underfur, but the longer guard hair, with its alternating light to dark color bands gives the animal a "frosted" look. Fur on the underside is white to gray, with yellowish tips. The bushy, flattened tail has black to dark buffy brown fur, with whitish tips. The hindlegs are short and powerful, with five well-developed digits, while the forelimbs have only four digits (the "thumb" is not developed, and is covered by a flat nail). The large incisor teeth continue to grow (as in all rodents), and need to be worn down through chewing. Habitat: Woodchucks prefer sloping pastures and cultivated fields, adjacent to small woodlots and sometimes stream banks. They utilize loamy soil to build burrow systems, usually with separate dens for nesting and hibernating. Diet: Primarily vegetarians; they eat a variety of leaves, stems, and flowers of grasses; field crops; and herbs. Occasionally animal matter is consumed, such as snails, grasshoppers, June bugs, and rarely bird eggs. Also, they are known for their love of gardens. Breeding information: Breeding occurs following the end of hibernation in early spring. After a 31-32 day gestation period, 2-9 (average 4-5) young are born, usually in early May. Offspring are fully active at approximately 6 weeks, and are not usually sexually mature until their second spring. The young are playful and often wrestle. Status in Tennessee: Common in their preferred habitat across the state. Often referred to as "whistle-pigs" for their many vocalizations; Woodchucks will often grind and chatter their teeth when cornered. They will occasionally climb trees to escape an enemy or obtain a better vantage point. Best places to see in Tennessee: Along fencerows or along field borders, especially around farmland. Schwartz, C.W. and E.R. Schwartz. 2001. The Wild Mammals of Missouri, 2nd Edition. University of Missouri Press and Missouri Department of Conservation, Columbia, MO.